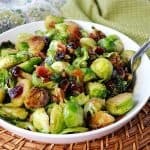 If you’ve never been a fresh Brussels sprouts fan before this recipe for Sauteed Brussels Sprouts with Sweet & Spicy Candied Bacon just may change your mind! And, if you’re already a Brussels sprouts fan, be prepared to have your mind blown when you add the sweet and spicy candied bacon topping. It’s the best and an excellent complement to the caramelized Brussels sprouts!! 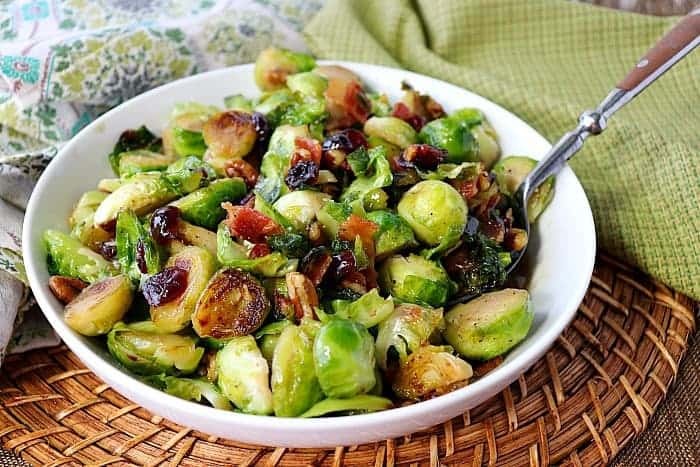 **Please Note – The printable recipe card with detailed instructions, complete ingredient measurements, and nutritional information for making Sauteed Brussels Sprouts with Sweet & Spicy Candied Bacon is available near the end of this post. Can I use this sweet & spicy candied bacon topping on other vegetables? It would be delicious on cooked green beans, asparagus, carrots, broccoli, cauliflower, or even over grilled romaine lettuce if you really want to think outside of the candied bacon topping box! AND, what about over a cooked sweet potato? Be still my heart!! I think I’m in love with this idea and can’t wait to try it for myself! 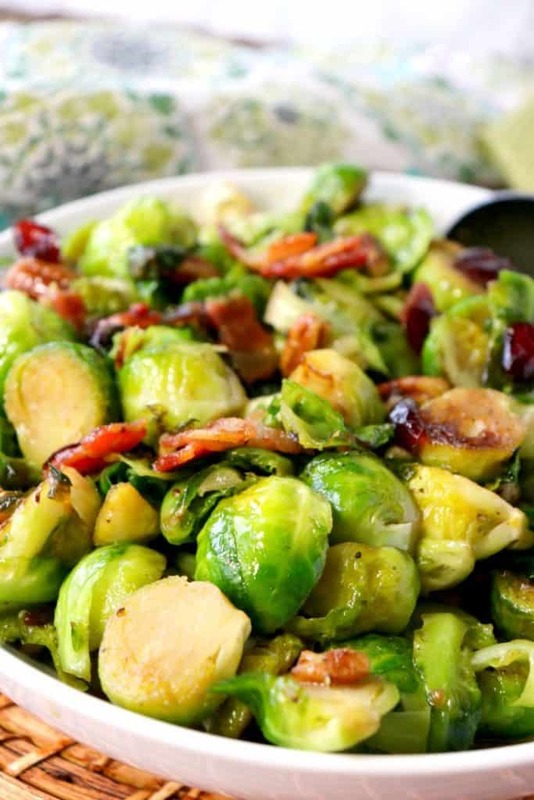 Below is the printable recipe card for today’s Sauteed Brussels Sprouts with Sweet and Spicy Candied Bacon. 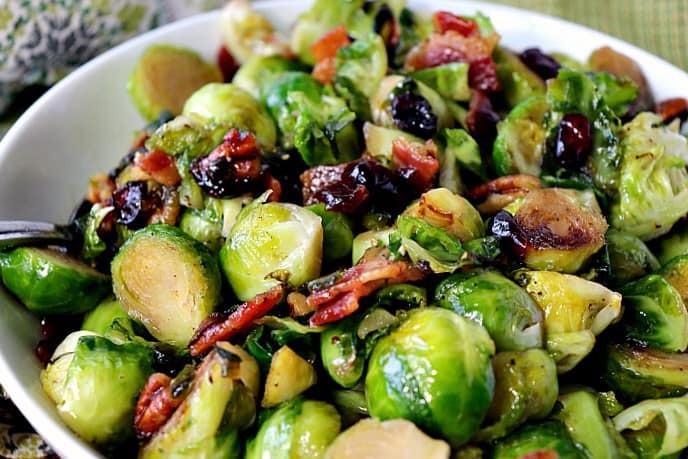 If you've never been a Brussels sprouts fan before this recipe for Sauteed Brussels Sprouts with Sweet & Spicy Candied Bacon just may change your mind! In a large skillet, cook the bacon until almost crisp. Stir in the remaining candied bacon ingredients and cook over medium heat for 2-3 minutes. Set aside. In a second large skillet, saute the prepared Brussels sprouts in the oil and butter over medium/high heat. Season with salt and pepper and stir occasionally. Reduce the heat to medium and cover the pan. Allow the Brussels sprouts to cook, covered, for 5-7 minutes (or until your desired doneness). Uncover and spoon the sweet and spicy candied bacon into the Brussels sprouts and stir well to heat through. 2 large skillets, wooden spoon, measuring cups, measuring spoons, cutting board and chef's knife, cover (or foil) for the skillet. I sincerely hope you’ve enjoyed today’s fresh Sauteed Brussels Sprouts with Candied Bacon recipe as much as I’ve enjoyed bringing it to you! I’m always on the lookout for new side dish recipes and this one was a winner. The whole family enjoyed! I’m glad to hear about that, Jessica! Thanks. This is one of my absolute favorite side dishes! YUM! How nice! I’m happy to hear it! Thanks, Wilhelmina! This looks fanstastic, it will be a great way to encourage my children to enjoy vegetables. Thanks so much for sharing this great recipe, Renée! Definitely, Mary! Good luck. I hope your kids love these. If not, try the candied bacon on a different vegetable. I don’t know why I haven’t had Brussel sprouts with bacon before. Love the way you candied the bacon too! 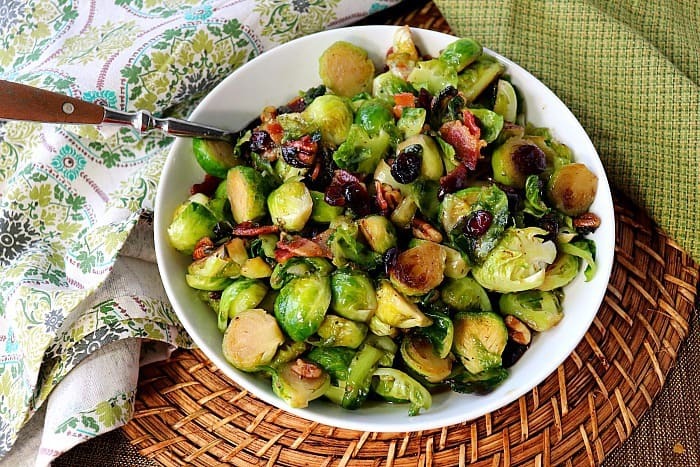 I love Brussels sprouts and bacon together…and I especially love how you candied the bacon! This will be a sure hit! Looks delish!